The 2018 recipients of the MacArthur "genius" grant. In fact, those criteria fit all 25 winners of this year's MacArthur Fellowship, better known by its affectionate nickname, the "genius" grant. Their pursuits span a range nearly as wide as the world itself. That spectrum includes mapping legal aid across the country for the benefit of low-income populations, uncovering abuse in West Virginia's coal industry, and coming up with radical fictions and bringing down pernicious artistic tropes. Now, with a rather sizable infusion of cash that has no strings attached, it includes some even loftier aspirations. "I have promised myself that I will do something new and different with it. It could be both related to my research or something completely different," Sarah T. Stewart, who won a grant for her work exploring how planets collide, tells NPR's All Things Considered. "Right now, I'd like to be as creative with it as the creativity that inspired the award." And that inspiration goes both ways, according to Cecilia Conrad, the MacArthur program's managing director. In a statement Thursday, she concisely laid out one major reason why they've been picked for the grant: "Their exceptional creativity inspires hope in us all." 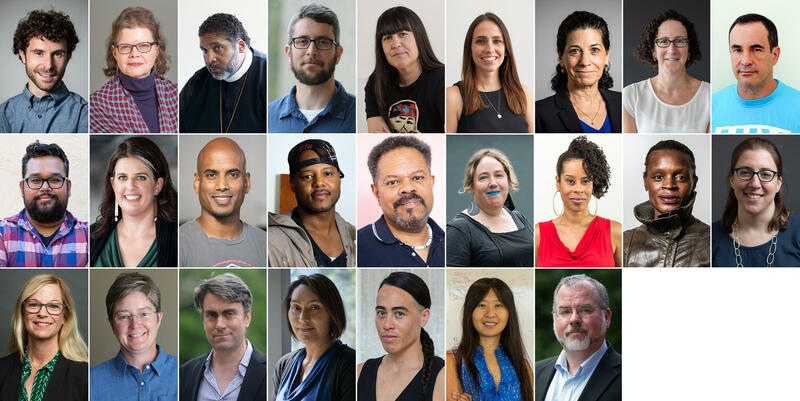 Scroll down to find the full list of winners — along with NPR's previous coverage, where available, and the MacArthur Foundation's reasons why they were selected. "Expanding the potential of vocal and orchestral music to convey emotional, dramatic, and literary meaning." "Redefining the role of the artwork and the artist by melding artistic, curatorial, archival, editorial, and activist practices into a new form of cultural production." "Building broad-based fusion coalitions as part of a moral movement to confront racial and economic inequality." "Using the principles of soft matter physics and cell biology to illuminate novel mechanisms of cellular compartmentalization that drive biological development." "Drawing on her experience as a Mojave American and Latina to challenge the mythological and cultural touchstones underlying American society." "Developing mass spectrometry-based methods to differentiate more quickly and accurately diseased from healthy tissues during surgery." "Designing open-source platforms that leverage mobile devices and data to address socio-technological challenges such as personal health management." "Formulating robust empirical methods to illuminate the hidden complexities of health care policy and provide data-driven guidance for future innovations in theory and practice." "Working at the intersection of human rights and public health research and practice to address inequities in global health." "Providing musical enrichment and valuable human connection to the homeless, incarcerated, and other under-resourced communities in Los Angeles." "Mobilizing the resources of law schools and law firms to defend the rights of refugees and improve protection outcomes for many of the world's most at-risk populations." "Creating a model of grassroots collective action that enables individuals facing incarceration, their families, and their communities to play an active role in their defense." "Highlighting the lack of representation of people of color in the canon of Western art with works that deconstruct the literal and visual structure of the artwork." "Exploring the impact of historical narratives on contemporary lives and re-imagining the history of the Americas from the perspective of suppressed voices." "Pushing the boundaries of literary fiction in works that combine the surreal and fantastical with the concerns and emotional realism of contemporary life." "Examining the intersection of choice and circumstance in works that portray individuals and communities grappling with economic and social changes." "Making visible the interior lives of women whose stories of resistance and resilience have been left out of dominant cultural narratives." "Advancing the scientific understanding of gender and shedding light on the social and cognitive development of transgender and gender-nonconforming youth." "Exploring the global reach of information technology infrastructures and the cultural, political, and humanitarian implications of the flow of information." "Promoting a new, evidence-based approach to increasing access to civil justice for low-income communities." "Applying probability theory to resolve long-standing problems in statistical physics and computer science." "Advancing new theories of how celestial collisions give birth to planets and their natural satellites, such as the Earth and Moon." "Creating new conceptual and visual vocabularies for exploring hidden histories and marginalized narratives in works that collapse the boundaries between documentary and fiction." "Uncovering the fundamental neural principles that underlie one of the primate brain's most astonishing capabilities: perception of the visual world." "Revealing the human and environmental toll of natural resource extraction in West Virginia and spurring greater accountability among public and private stakeholders."